Sorry that I’ve been so absent from your lives. I blame it on travel and, strangely, Ice Cube. Anyway, here’s another one of my interviews for Time Out New York, this time with David Duchovny. 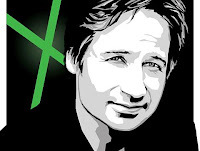 Is anyone as geeked as I am to see the new X-Files movie? Or am I living in the past, man? Inertia. And the destruction of Tigers Stadium. Posted on July 17, 2008 by johnsellers	This entry was posted in Uncategorized. Bookmark the permalink.